The easier way to install Sick Beard on Windows? Home Home Server The easier way to install Sick Beard on Windows? Sick Beard is a PVR for newsgoup users (with limited torrent support). It watches for new episodes of your favorite shows and when they are posted it downloads them, sorts and renames them, and optionally generates metadata for them. A detailed post on SickBeard's features and how they compare with its rival NzbDrone was presented in an earlier post. Sick Beard is very similar in operation to CouchPotato except that it works for TV Shows. If you install Sick Beard correctly, all the above functions should work flawlessly giving you an automatic Usenet downloads and organization of TV Shows. Without further delay, lets install Sick Beard. For apps like Sonarr, Radarr, SickRage, and CouchPotato, Usenet is better than Torrents. Unlimited plans from Newshosting (US Servers), Eweka (EU Servers), or UsenetServer, which offer >3000 days retention, SSL for privacy, and VPN for anonymity, are better for HD content. For more plans that may fit your needs please read our Usenet plan selection guide. Download the latest Windows binaries from here. 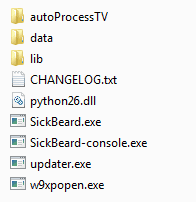 Extract the downloaded .zip file to whichever folder you want Sick Beard to run from. Installation is now done. It is as simple as that. 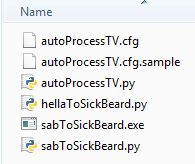 Before starting Sick Beard, I recommend creating a copy of the file autoProcessTV.cfg.sample in the folder autoProcessTV. Rename the copy to autoProcessTV.cfg. For now, http://localhost:8081 should so. You may update Sick Beard by clicking on the “Update Now” notification that would appear on top of the screen whenever there is an update available. As pointed out above, it may take several days for the developer to update the Windows binaries. 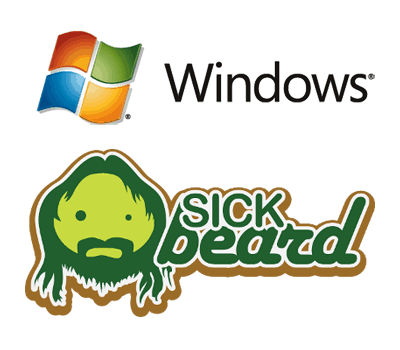 After you install Sick Beard, you can configure it as described in the following post: How to Configure Sick Beard?. It explains all the settings in detail with screenshots. After configuring your Sick Beard, you may return to this post and continue. 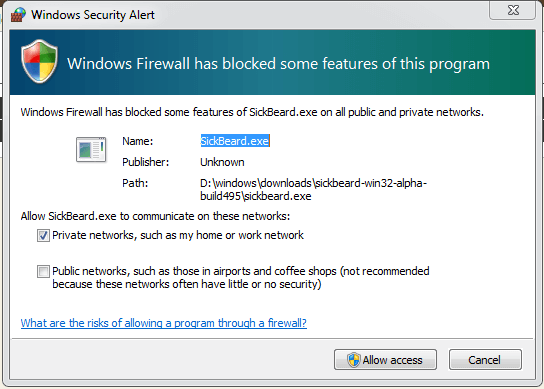 In order to make Sick Beard function properly, you will have to install and configure SABnzbd to listen to downloads requests from Sick Beard. Refer to my SABnzbd installation guide and configuration guide to properly automate downloading TV Shows. As mentioned earlier, you also require a reliable Usenet account. You may get a free Usenet account as described in this post, or go with a reliable Usenet service from Astraweb or Newshosting. Autostarting Sick Beard is easy. Create a shortcut to SickBeard.exe file and move/copy the shortcut to C:\ProgramData\Microsoft\Windows\Start Menu\Programs\Startup folder as shown in the picture below. Thats it. You are now fully done. Install Sick Beard and enjoy. How to configure Sick Beard?